The ingredients couldn’t be any easier: Hot sauce, elbow macaroni, Panko bread crumbs, half and half, mayonnaise, cheddar cheese, muenster cheese, butter, and Velvetta… yes THAT Velveeta! There are three parts to this recipe: the Panko topping, the cheesy topping, and the mac and cheese itself. For the Panko topping, melt a tablespoon of butter and mix with a cup of Panko bread crumbs then add a few dashes of hot sauce and set aside. For the cheesy topping, combine shredded cheddar, Muenster cheese, hot sauce, mayonnaise, salt, and pepper. 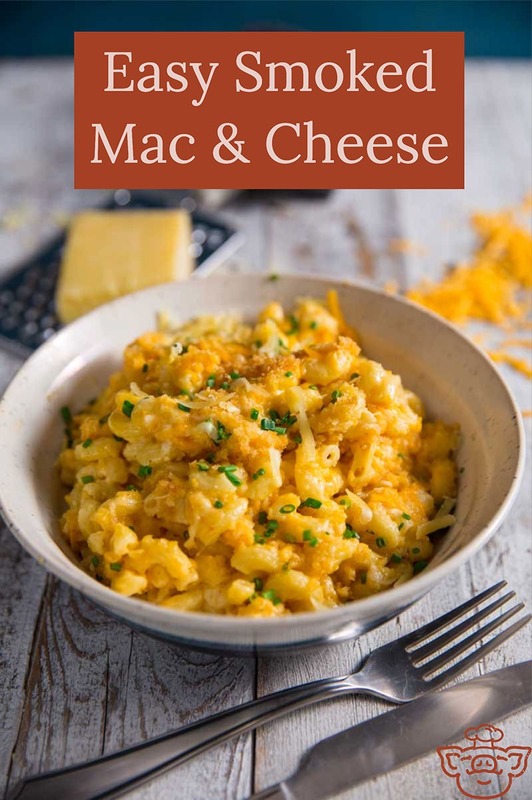 Mix well and set aside while you make the mac and cheese (you can also go even easier here and substitute pimento cheese for the cheesy topping if you’d prefer). For the mac and cheese, boil the elbow macaroni al dente. When it’s done, drain the pasta, add back to the warm pot, mix with the butter, Velveeta, shredded cheddar, Muenster cheese, and half & half. When all the cheese is melted and evenly distributed, pour in to an aluminum half pan (you can also use Cast Iron Pan for crisper edges and bottom). Top with the cheesy topping and then the Panko topping. NOTE: When I did this post originally, I forgot to take a picture of the Panko topping. So, I recently made a batch of this for a family gathering and grabbed a photo. You will see this batch is in a Cast Iron Pan which is a great way to cook this dish if you have one. For this cook I used my Traeger Grills Timberline 1300 (note: you can use any smoker or grill setup for indirect cooking). Set the temp to 350° and use Apple Wood pellets for the smoke. Once the grill is up to temp, place the pan in the grill (uncovered) and let cook for 30 minutes. After 30 minutes, pull the mac and cheese and let rest 5 minutes until ready to serve. This easy smoked mac and cheese is so gooey and delicious… thank me later! This recipe for easy smoked mac and cheese focuses on the ingredients, not the technique. This way you can get up and running with a delish side dish for your next BBQ without fussing with the roux.